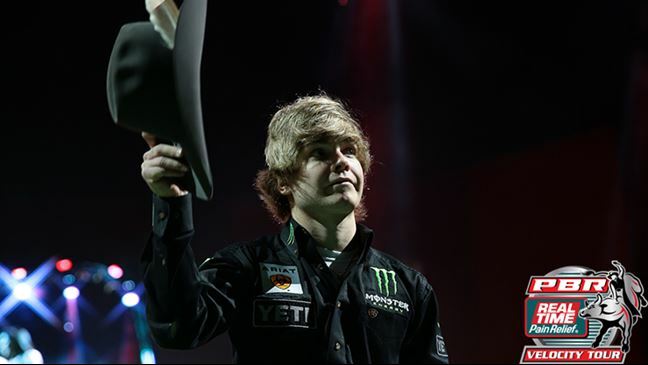 CLOVIS, Calif. – Derek Kolbaba (Walla Walla, Washington) earned his first PBR (Professional Bull Riders) Real Time Pain Relief Velocity Tour (RVT) victory of the year Thursday night at the Clovis Rodeo Arena. Kolbaba started the night off with an 87-point ride on Shot Collar in the first round before going on to win the championship round with an 85.5-point ride on Bottle Rocket. Kolbaba is walking away from the night with 80 world points and $10,570.23. He is currently No. 5 in the PBR world standings. California native, Aaron Williams (Pismo Beach, California), earned second place after covering Uncle Anthony for 78.5 points in Round 1, and Circuit Breaker for 82 points in the championship round. Williams earned $6,560.83 and 50 points toward the world standings. Ramon de Lima finished in third place after turning in a 79.5-point ride aboard Hummer’s Gold in Round 1. He is walking away with a $4,082.30 check, and 30 points toward the world standings. Fourth place went to Joao Ricardo Vieira (Itatinga, Brazil), thanks to an 87-point ride on Cowboy Up in Round 1. Vieira had the lead after the first round, but couldn’t hit 8 seconds in the championship round. Vieira earned 3,572.01 and 20 points toward the world standings. Finishing in fifth place was Cody Nance (Paris, Tennessee), who covered Anchor Man in Round 1 for 85 points. Nance pocketed 15 points toward the world standings and $2,099.47. Emilio Resende (Santa Helena, Brazil) rounded out the Top 6 after an 84.5-point ride aboard Catfish Clinger in Round 1. Resende earned 10 points toward the world standings and $1,253.85. The Real Time Pain Relief will continue this week in Wichita, Kansas, for the Wichita Classic April 29. The 2017 Velocity Tour will culminate with the Velocity Tour Finals at South Point Arena in Las Vegas on Oct. 28-30, leading into the PBR’s Built Ford Tough World Finals, Nov. 1-5 at T-Mobile Arena. © 2017 PBR Inc. All rights reserved.